The grand master of hazy house music and head coach of the famous don’t-take-yourself-too-seriously method, Route 8 was among those who had the chance to play on the first Boiler Room Budapest. His appearance didn’t come as a surprise, as over the past four years he’s become the unofficial go-to guy when it comes to edgy club music from Hungary. Now he’s on Lobster Theremin’s roster and plays abroad more than in his homeland. Gábor Lázár is one of the most respected electronic musicians in the country—and for good reason. He has a really impressive resumé: he collaborated with Russell Haswell and Mark Fell, released records on Lorenzo Senni’s Presto!? label as well as Boomkat’s The Death Of Rave and Shelter Press. And all the while he’s toured extensively. He often uses a single note of a pure synth sound to create abstract and comprehensive studies of dance music tropes and rhythmic perception. Lately his experimentations with funk have been coupled with a light installation that takes the mind-altering effect of his show to the next level. The newest member of Budapest’s lo-fi house mafia Farbwechsel is also (as far as we can tell) the first woman to join the crew: Yinna. She established Budapest’s feminist DJ crew A C I D W I T C H with Alexandr, which project also entails regular club nights called SEANCE. Her show on the local online broadcaster Tilos Radio, Outline, traces developments in so-called “outsider house,” and that should give you some idea of what to expect from her DJ sets and productions. What began as a warm-hearted electronic pop project with singer Júlia Horányi is now a much deeper one-man show that’s sometimes supported by guest vocalists. Gergely Álmos is an architect and movie set designer by day, which explains his persistent attention to detail apparent on his third album EIGENGRAU, released in 2016 by Berlin’s Sonar Kollektiv label. If you feel galactic while listening to it, that might be because Gergely created the songs in a period when he also worked on the recent sci-fi hit The Martian. As the founder of Hungary’s renowned label Farbwechsel and a talented producer whose track record includes releases on imprints like Opal Tapes, Lobster Theremin and Lee Gamble’s UIQ, S Olbricht is definitely a central figure in Budapest’s scene. His natural habitat lies between distorted techno and house beats, among meandering, moody melodies and inside the subtle hissing noise that beautifully permeates all his work. What really sets him apart is his absolutely refined taste, excellent instinctual knowledge and use of proportions. With him, nothing happens by accident. He will bring it each and every day for a long time to come. Alexandr is not only the co-high preistess of feminist DJ collective A C I D W I T C H; she also runs the monthly queer party OMOH at Budapest club Corvin and the techno spot Lärm. As a resident DJ there, Alexandr has a regular opportunity to share her take on floor-friendly house and techno. Some weeks ago, a mystic video appeared under the name Surfalone. It’s no secret anymore that the face behind the mirror-mask and the hoodie belongs to Laszlo Papp, a mainstay of the Budapest techno scene who has been DJing for over a decade as Subotage. He’s also played an instrumental role in organizing grandiose events and small club gigs with his crew, NVC. His new project started as a therapeutic exercise after a hard breakup and morphed into a journey inwards, with ethereal melodies reacting to bold synths and techno grooves. An album is on its way, too. Wedding Acid Group is well known in the Budapest underground for their rare but high-octane shows. Theirs is straight-up party music for silly ravers with a punk attitude: sped up, melodic and playful at the same time, somewhere between Legowelt and Ceephax Acid Crew. J Mono is the most introverted member of the team as well as the exact opposite of what WAG represents. In his private life he works in agriculture in a rural town, and you won’t find him doing long speeches on a drunken Friday night. But when he sits down behind his machines, magic happens: this silent genius unleashes his effortless melody-maker abilities like no one else in the country—and perhaps even Europe. You’re in a factory packed with heavy machinery. Not a single beam of light enters the enormous place. A moderately disquieting bad trip just starts to wear off. You are by yourself, and the machines are starting to work ominously against your ears. That’s how you might feel in the middle of a FOR. performance. Ábris Gryllus and Miklós Farkas decided to leave their daytime graphic designer suits behind to work on dense and intense post-industrial soundscapes, and the output is something that works best when you catch them live. So…catch them live. 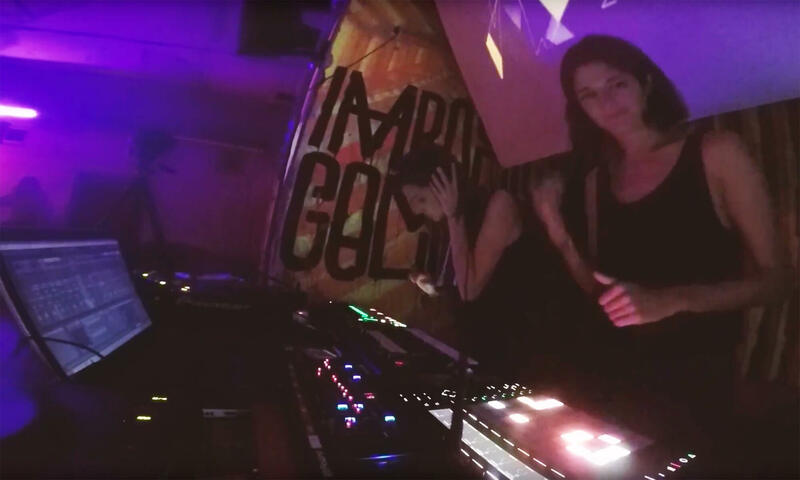 Budapest-based live techno duo Wave Twins was formed in 2015 following some early collaborations between members Laura and Anna Tóth. They quickly won over the local electronic scene following their debut at the local festival Ladyfest 2017. Their constantly evolving live set consists of elements of techno, house and experimental electronica, and they utilize numerous gadgets to create their sound.